The Cleveland Museum of Art’s Crucifixion of Saint Andrew by Caravaggio is a masterpiece of baroque painting. It is one of only eight works by Caravaggio in the United States and the only altarpiece by the artist in America. Painted in Naples in 1606–7, the work was taken to Spain in 1610, where it likely remained for hundreds of years. The painting was acquired by the Cleveland Museum of Art soon after its rediscovery in the 1970s. Just this week, this centuries-old painting graced the June 2018 cover of The Burlington Magazine, a prestigious monthly academic journal that covers the fine and decorative arts. Established in 1903, it is the longest-running art journal in the English language. Author Richard E. Spear took an in-depth look at Caravaggio and the Crucifixion of Saint Andrew. He asks two key questions in his article: are there autograph replicas (faithful second versions) of the Crucifixion? And what might scientific analysis of Caravaggio’s paintings add to this scholarly pursuit? 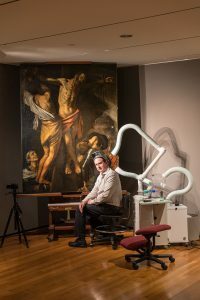 Featured in The Burlington Magazine article is the CMA’s conservator of paintings Dean Yoder, who spent nearly three years studying Caravaggio’s working technique, cleaning and conserving the painting, and analyzing technical images. 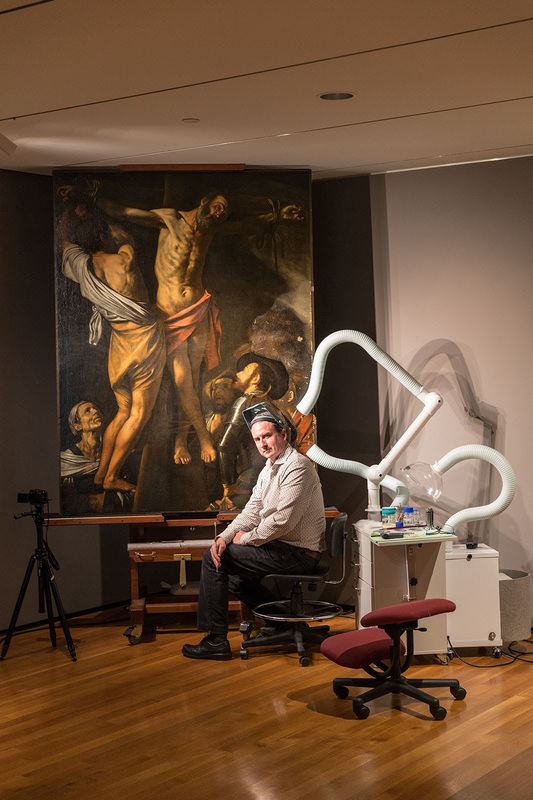 The discoveries made during this process are now shared in Conserving Caravaggio’s “Crucifixion of Saint Andrew”: A Technical Study, an interactive app detailing the methods of analysis that Yoder used — including X-rays, pigment analysis, infrared reflectography, UV irradiation, Raman spectroscopy, and more — to illuminate aspects of Caravaggio’s working process and uncover details of the painting’s genesis and execution. The Burlington article also features the scholarship of Erin E. Benay, PhD, Climo Assistant Professor of Renaissance and Baroque Art at Case Western Reserve University. 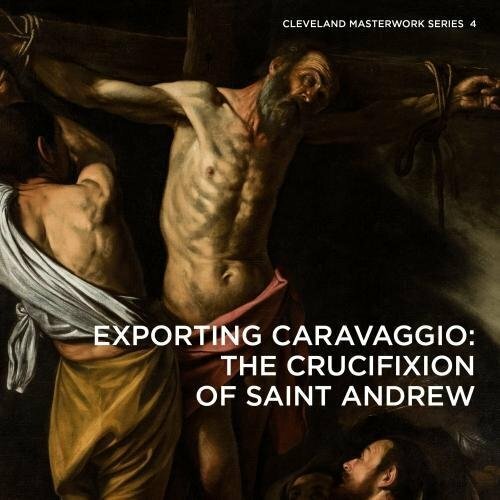 Dr. Benay recently spent several years following the conservation efforts at the museum and authored Exporting Caravaggio: The Crucifixion of Saint Andrew (number 4 in the Cleveland Masterwork Series), published in 2017. Part of an ongoing focus series of books, Exporting Caravaggio is the first book-length publication to consider this understudied masterwork in its complex historical and geographic contexts, and to incorporate the findings of a recent conservation study in its assessment of the work.